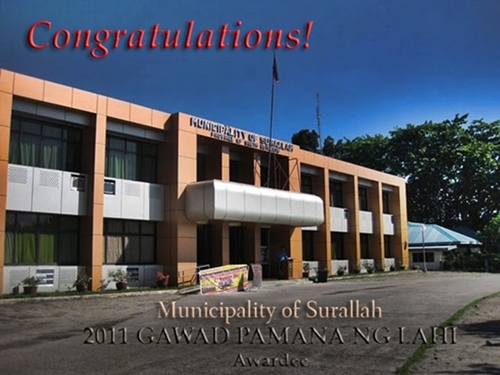 The Municipality of Surallah was among the 16 municipalities from all over the country that has been adjudged as winners in the Gawad Pamana ng Lahi Awards for 2011 presented by the Department of Interior and Local Government ( DILG). The award consisted of a trophy and a check of P1-million was handed over to Surallah Municipal Mayor Romulo Solivio, Sr. and the Surallah LGU by DILG Secretary Jessie Robredo last October 11, 2011 in an awarding ceremony held at the Philippine International Convention Center in Pasay City. Aside from the 16 municipalities, 15 cities and 15 provinces also received the same award. Gawad Pamana ng Lahi is conferred to local government units for their exemplary performance across major development initiatives in administrative governance, social governance, economic governance and environmental governance. It is also DILG’s mechanism to motivate local governments in the provincial, city and municipal levels nationwide, to continuously foster and strive for good and effective local governance and further scale-up the value of accountability, transparency and inclusivity in local administration and development. Congratulations to the people and the entire Surallah-LGU..